ETA: the end, at last! In times of so much neglect, of looking the other way, of so many passive spectators, I want to reiterate my gratitude to those who, like Forges, remind us each day what we must keep in our minds and hearts, to gradually begin to change our behavior. Haiti and Somalia, the inhabitants of these two countries: they need solidarity, especially from those who live in the world’s most prosperous areas and who very frequently allow themselves to be manipulated by information that transforms them into simple recipients without the ability to react, without the courage to cease to think only of themselves and to turn their attention to those in need. Doing so has many advantages since it not only makes you more appreciative of what you have, but also helps you understand the needs of others. With exemplary insistence, Forges shows us the real challenges that we should bear in mind and assume as our own, especially when (although hounded by the markets –what an immense error it was in the 1980s to have replaced ethical values for those of the stock markets) we are about to celebrate our Christmas holidays and (despite it all) are wishing each other the best for 2012. Haiti and Somalia… and all of those who live in conditions that can hardly be described as human: we will feel much better if we really show that we care. If we take into account all lives and not only our own. 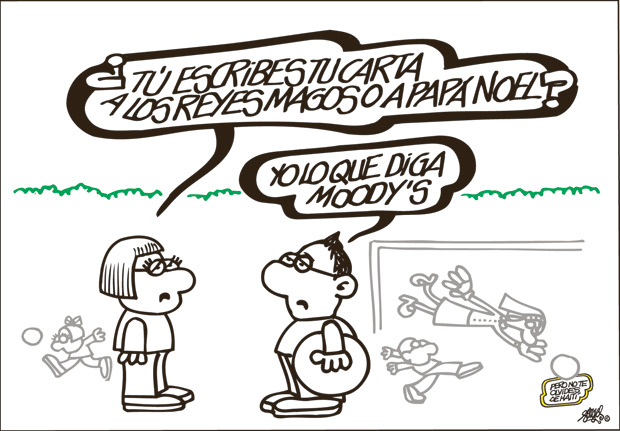 Forges’ reminder is the best New Year’s message of them all. 1) Re-founding the European Union... Re-founding on the same pillars and with the same structures that have prompted the present situation? Re-founding based solely on the economy? Re-founding based on money? It may serve to “save the euro"... But not for saving Europe and the Europeans, which is what really matters. Europe could be saved by reestablishing the democratic principles (social justice, solidarity, equality) that were erroneously replaced with those of the market. Creating a fiscal federation with the capacity (as is the case in the US and UK) to issue currency or eurobonds; and converting NATO into an autonomous security system with immediate cuts in investments in arms and military spending... replacing an economy of speculation, delocalization of production and obedience to rating agencies with an economy of global sustainable development. 2) Creating employment without incentives? How can employment be created without public works and support for SMEs? I must once again underscore that it is essential to have the autonomy to quickly issue the money needed to reactivate existing enterprises and create new ones. The US has issued 300 billion dollars and the UK has minted 75 billion pounds sterling precisely for this purpose. In contrast, in the Eurozone there are budget cuts, austerity measures and a reduction in the workforce. This is not the way. The right way is democracy, which has presently been displaced by the markets. It’s now essential to put the people first. Prosecute the best-known judge in the whole world because he had the courage and vision to believe that justice is universal! And who believed that there can’t be a good future if we know so little of the past. For the final reconciliation of Spaniards it is essential that those who lost the civil war be able to know exactly what happened and, to the extent possible, to approach and honor the victims. Those who won have already had many years and much help in doing so. And in view of the source of these accusations, it’s really incredible that they are going to prosecute the person who has most fought to preserve the memory of the past. We have the duty to remember. Our personal and collective memory is a fundamental part of our heritage. And Judge Garzón will continue to receive the recognition that he deserves, both at home and abroad. It is urgent to decide to reform our Electoral Law. Let’s not delay this by saying that it’s not appropriate “because we just had elections", "because the ballot boxes have just spoken"... For a long time political parties and civil society (especially the 15-M movement and internet users) have insistently demanded a change in our electoral law that is inadequate and anti-democratic. This cannot be delayed if we don’t want to have to maintain our present tightrope walker situation and a sense of weakness with respect to representing the will of all Spaniards. It should be underscored that under the present Law, citizens will simply choose not to vote. And they will adopt this position in support of pluralism and public liberties. It’s that simple. No more elections under the present unequal system in which there is no correspondence between the number of votes cast and the number of seats won. In “El País”, citing Primo Levi, Manuel Rivas referred to the "vacanza morale" that is responsible for the present problems in Spain and in Europe. This moral deficit is proving to be very dangerous because, in addition to its “collateral effects” of corruption, fallacies and constantly broken vain promises, it appears to affect citizens who, distracted, preoccupied, patient (in both meanings of the term) and disillusioned with politicians and with everyone else, continue to demonstrate the same routine, submissive and mindless behavior during elections. 5) Press conferences... with no questions allowed? Journalists should no longer tolerate this lack of respect. Why do they attend press conferences when they know that they will be prevented from exercising their profession? Why don’t they get up and leave when they realize that there won’t be any interaction with the speaker? Why do they stay for sessions in which they are limited to listening to statements from a “talking head”? I underscore this because one day they will regret having lost their rights and dignity. And the full exercise of the responsibility of journalists is essential for citizens and for genuine democracy. 6) Elections in Russia. It’s good that citizens are protesting. It’s bad that the US is intervening and criticizing. It’s great to see thousands of citizens in Russia today freely expressing their protests and disagreement! It’s great!... because I remember the total silence, absolute obedience and complete submission that so impressed me on my first visit to the Soviet Union in 1961. And, later, on several other trips... until Gorbachev. Citizens were for all effects invisible, inexistent. For that reason I am now quite pleased to see citizens who disagree and demonstrate freely. In contrast, I find it totally inappropriate that Ms. Clinton has not only criticized the elections and their lack of transparency, but has likewise extended her comments to Russia’s position against the deployment of anti-missile shields initiated by President George Bush. In light of the present situation the last thing we need is to increase military spending (already excessive from any perspective) with anti-missile shields! Sooner than many may suspect, good governance will arrive on the voices of the people. Those voices that now, in Russia and in other places, are heard and are being heard. And in support of building, among us all, a strong and efficient United Nations, to finally make the visionary “We, the Peoples” of the UN Charter a reality. We cannot continue to be distracted, self-absorbed, spineless spectators of the immense and certainly foreseen failure of a system that while attempting to perpetuate itself despite its state of ruin, uses all imaginable means to keep us quite numb and incapable of reacting and expressing our protests and proposals, our agreement and disagreement. And the living conditions of a majority of mankind? And the damage to the environment and to the habitability of the planet? The “system” relegates and postpones matters essential for compliance with our duties to future generations, the legacy that we must leave those who are arriving one step behind us. It will soon be the 20th anniversary of the Earth Summit in Rio de Janeiro. I remember how carefully and meticulously we planned it, especially in the United Nations, to ensure that Agenda 21 would provide an appropriate means for healing Mother Nature’s wounds, and preventing many others. With these guidelines and roadmaps, it’s no wonder that the few attempts to reduce environmental damage and climate change have come to nothing. Kyoto… Durban…: the countries that emit the most CO2 and gases with greenhouse effects, the ones most responsible for polluting the earth, seas and air will not assume commitments, alleging reasons that are undoubtedly a serious insult to the whole of mankind, given that these processes are potentially irreversible and, thus, subject to the ethics of time. Today I am writing these paragraphs with much urgency, because the preparatory meeting for Río+20 once more suggests that the superpowers’ attitude will be one of indifference and ambiguity, when their commitment and attention are more urgent and necessary than ever. The time for mobilizing the people has come. It is time to demand, without further postponements, the attention that Mother Earth deserves. A few (the G-8…, G-20…) cannot and should not impose their will on 196 countries. Let’s activate a broad and dense web in Cyberspace, let’s sign the petitions that arise from all corners of the earth, so that there will soon be millions who demand that Río+20 should represent the beginning of a new era, a historical change of course in which ethical values and democratic principles will finally prevail. If we are many, it will be possible. When I hear so many newly-elected leaders complain of the “state in which they’ve found their offices"... I recall the Russian story "The Three Envelopes", that I published years ago (El País, 13 November 1982) and which is certainly applicable today, those who will soon assume office are following the well-established custom of initially exaggerating the situation, despite the fact that in the specific case that I allude to here and in many others they were quite aware of the seriousness of the situation from their own “homegrown” experiences in the Autonomous Communities where they have governed for quite some time. "The new Rector still speaks favorably of you?". I vigorously indicated that he did, making gestures with my lips and head to show my full conviction that it was so, which perhaps did not disguise my surprise at the question. “Well, he will soon cease to do so, you’ll see", observed a well-know Russian scientist visiting the University of Granada. His assertion that my successor would inevitably blame me for many of his problems had left me quite perplexed. Observing that, he continued: "Do you know the story of the three envelopes? It’s an old Russian tale that is applicable to all transfers of power. When leaving office, the out-going official discreetly leaves the newly-elected official three envelopes numbered 1, 2 and 3, telling him to keep them in the middle drawer of his desk and to open them in numerical order when he feels he is really in trouble. After a few days, perhaps a few weeks, the initial favorable perspectives have faded; everything becomes difficult, there are many urgent problems... and in the loneliness of his office, the new official decides to open his predecessor’s first envelope. The letter it contains simply says “Criticize me. Blame it on me"... And despite it all, the advice worked and, in effect, for several months the new leader was able to manage the situation by referring to his predecessor’s mistakes, the “lamentable state in which he left all of this” or “the former leader’s total lack of foresight", etc. But of course the time comes when the transfer of power is too distant a memory to blame everything on the predecessor. And things are not going well and, why deny it? It is improbable, very improbable that such complicated situations can really improve substantially. And the time arrives when the lonely, stressed leader opens the center drawer of his desk and takes out the second envelope. The letter inside reads: "Nothing can be done with the present structures. Change them". The structural reforms bring our man much personal satisfaction and prompts great expectations. For a while the reforms implemented (some of them so admittedly irrelevant, such as moving the 6th floor offices to the 2nd floor, and the 2nd floor archives to the 6th) boost the leader’s image and warrant the praise of his superiors. But although it may be a result of the logical wear and tear of holding a position of power, or more frequently due to the leader’s ineffectiveness and incompetence in office –and here my colleague’s expression was dark and fatalistic- sooner or later a point is reached in which even new structures don’t resolve the serious problems faced by the protagonist of our story. Circumstances become such that, recognizing that it is his last recourse, he nervously opens the third envelope which reads: "Rapidly prepare three envelopes for your successor. Your dismissal is imminent". Since then I have frequently reminded this splendid Russian story. And I am reminded of it today with satisfaction that the fundamental changes that have taken place in our country allow it to be told again... And as then, but even moreso now, we can revisit the story in light of the fact that here there have been no resounding dismissals in the governmental change of power, but rather an ordered transfer of functions prompted by elections. Moreover, regardless of whether the first-envelope measures may sometimes be warranted and the second-envelope measures reasonable, alternation in power characteristic of democratic countries precludes their being a third envelope, because those in power in truly free countries know that they are being watched by the real protagonists of democracy: the people. The tidal wave of the world and, particularly, the European crisis is seriously affecting not only the implementation of political programs but also the very foundations of effective democratic practice. When in the 1980s President Regan’s ambitions of dominance, aided by Prime Minister Thatcher, were successful in persuading a large part of the developed world of the need to replace ethical principles with the “laws of the market”, a period was initiated in which Nation-States were weakened, the multilateralism of the United Nations was replaced by groups of plutocrats (G6, G7, G8, G20) comprising the wealthiest nations of the world, and there was a process of delocalization of a large part of production, with insatiable greed... Very few warned of the profound consequences that would ensue from these essential changes in world governance. The telecommunications (1993) and real estate (2007) “bubbles” and their corresponding economic fluctuations gave rise to a multiple (ethical, democratic, political, food, environmental, financial) crisis that has been mishandled, using the same suppositions and means of action that prompted the disaster. The “rescue” of financial institutions promoted by President Bush through the G20 gave new wings to the “rescued” and impoverished the “rescuers”. Instead of promoting an effective renewal of multilateralism and reestablishing ethical principles and human rights as guidelines for political action, neoliberal policies were pursued, particularly in the “West”, and the “great domain" (military, financial, media, oil) gradually re-gained the reins of the system to reinstate the strength of the dollar zone, and subsequently the yuan, over the euro zone. After mercilessly hounding the most fragile countries (due to their financial policies and “bubbles”), they have rapidly achieved political changes (even in Ireland, which until very recently was considered a model in economic school curricula), although initially (in Ireland, United Kingdom, Portugal) the changes took place quickly but within democratic procedures. Spain was obliged to effect profound changes in the government’s program... that has so far enabled it to escape a “rescue” and the storms that have devastated Greece and Italy, whose parliaments and governments have been eliminated and revamped to please the markets. All of this is extremely serious and requires rapid and categorical responses from the European Union. And, nevertheless, the EU has continued to maintain structures and procedures that instead of strengthening it, have increased its weaknesses, placing the EU at the mercy of rating agencies and the most audacious speculative practices... while the United States is now focusing its attention on Asia and the Pacific, seeking new alliances with the main emerging countries, including those in Latin America. As Robert Schuman noted in1950, Europe must use its “great creative capacity” instead of submitting to economic norms and guidelines, and policies that are now merely anachronisms. We have to invent the future; we must once and for all abandon strategies that have created a world of 7 billion inhabitants where only 20% of them live in the most prosperous areas, while the rest, who suffer a progressive lack of the basic necessities, reach limits of extreme poverty and death from starvation. For me it is a truly “obsession of conscience”, as a fact that demostrate the failure of “neoliberal globalization”, that each day 4 billion dollars are invested in weapons and military spending while at the same time over 60,000 people die from hunger. I will never tire of repeating this. No one should tire of repeating this and of bearing it in mind, so that it may guide our actions daily. Yesterday the Spanish people gave a resounding victory to the Popular Party, whose impassioned and united followers supported change against a Socialist Party that suffered a serious defeat, due to wounds from hounding or to the disappointment of many who abstained from voting or did so for other leftist forces. The Socialist Party will recover, thanks to those same values that now, having had to renounce some of them in the face of attacks from the markets, have brought it down. I must underscore with satisfaction that election day was admirably calm and, for the first time, did not take place under the disturbing shadow of ETA. Years ago I wrote that elections are a very important aspect of democracies, but that we shouldn’t only go by the exact results of the ballot box, but should ensure that the political actions of the elected officials permanently reflect the “voice of the people”. Otherwise, we will have been counted (so many votes for, so many against)... but we won’t count as citizens, and we won’t actually be taken into account afterwards. For that reason we have to underscore the extraordinary role that distance participation can play. We must listen carefully to the proposals and points of view of citizens who, as in the case of the 15-M movement, peacefully offer their perspectives. In the next few months and years cyberspace will be a key factor in strengthening or tempering the “loud and clear voice” of those who were formerly subjects but who are now full-fledged citizens. Citizens who so rightly call for electoral reforms, the appointment of judges without ideological bias, transparency in banking and the elimination of tax havens, etc, etc. It is clear, crystal clear, that the urgent problems facing our country will not be resolved locally, but rather largely within the framework of the European Union, which to-date has shown a lack of appropriate leadership. I have already mentioned on many occasions the pressing need to establish an autonomous security system, with a considerable reduction in military spending, commencing by ceasing to acquire out-dated military hardware; fiscal federation and the issuing of Eurobonds, since both the U.S. and the United Kingdom can "issue" large amounts of money, as they have done recently to promote innovation, while in Europe we have to carefully follow austerity measures that, alone, won’t allow for growth or create employment; banking transparency and, particularly important at present, a reinstatement of the democratic principles that have characterized the West, not merely as a democratic model or structure, but as universally-valid values. And just as a working democracy would be reinstated at the local level, a re-founding of the United Nations should be promoted at the global level. Without this “activation” on the part of Europe, the new widely-supported government will not be able to resolve problems and, above all, it will not be able to keep its key electoral promise: creating employment, being forced to make inadmissible cuts in social programs. In other respects, I hope that the responsibility that comes with power will moderate some of its positions (Law on Dependence, education for citizenship, etc.) which have been important “acquisitions” for the Spanish people and in which losses would be inadmissible. With everyone’s collaboration, let’s seek this new leadership that the European Union requires to resolve the majority of this country’s problems. Once again, Robert Schuman proclaimed in 1950 that “Europe will not be made all at once,… It will be built through concrete achievements which first create de facto solidarity". And, as Hugues de Jouvenel indicated in this month’s “Futuribles”, quoting Saint-Exupéry, "What saves a man is to take a step. And another... and another…”. Only then will we be able to overcome these last throes of the power of the markets, which change governments without elections and enslave their western rescuers... But this will not last long: citizens will shortly show that they will not allow a few rich countries to continue to hold the reins of their destiny. And democracy and politics will recover decision-making power based on the ethical principles that should never have been entrusted to the “markets”. In this new era there are reasons for all citizens, whatever their ideology, to feel committed and even optimistic at the advent of a new world in which social justice and intergenerational responsibilities, such as those that affect climate change, will form part of daily political action, and we will soon be able to forget the speculation and excesses that all mankind has suffered in the last few years. All equal in dignity. All equal in dignity, but only 20% living in the “welfare society”, in the most prosperous neighborhood of the global village… The rest, the other 80%, live in progressive stages of desperation, surviving in situations in which they are frequently pushed to the limit. The human race has doubled since 1969. It is true that birth rates have dropped in the majority of “developed” countries and there has been a general increase in life expectancy. In many countries birth rates have dropped below their death rates (that is, 2.1 children for each woman of child-bearing age). This is the case in Spain. The result is that world population is increasing an average of 1.1% per year, half of the rate in the 1960s. As indicated in the November 7, 2011 “Weekly Foreign Policy Report”, the drop in birth rates in a large part of the population alleviates pressure on the environment, but generates other economic problems derived from an increase in dependence, that is, in the percent of active vs. inactive population. In 1950 there were 6 children under 15 years of age for every person over 65. In 2070 those over 65 will outnumber children under 15. In the next 20 years, the dependence rate will surpass the present one. As an example, in 2050 40% of all Japanese will be over 65, and 50 % will be over 52, making Japan the most elderly society ever, with 3 dependents for every 4 adults. At the beginning of the next century the world’s population may reach 12,000 million. Is that possible? Is it possible for them all to have access to water, food, medical care? Yes: It’s possible if there is radical change. If there is the “new beginning” foreseen in the Earth Charter. A new era in which words replace force, and outstretched hands replace those that hold guns. Among other negative factors, “globalization” has made us forget the urgent problems of the environment. New world governance is essential. The present inequalities are ethically inadmissible. A few have a bit of everything. But the majority frequently lives in unbearable conditions. New energy, monetary, food and education policies are needed to ensure a minimum quality of life for all human beings. 7,000 million citizens subjected to the decisions of a few leaders of the G7, G8 or G20? No. We cannot tolerate a partial leadership, conditioned by economic aspects. A change of course is essential. If not, as underscored in the Preamble of the Universal Declaration of Human Rights, man may be “compelled to have recourse to rebellion”. I’ve noticed that in several matters of interest to the opposition or initiated by them, judges have acted with great haste (the EREs in Seville, the “Faisán” and “Campeón” cases; …; the trial of Judge Garzón (! )…), in contrast to the postponements, adjournments, measures of all sorts –when they are the suspects and hold political office…- to delay the proceedings until the statute of limitations on the judicial action has run out. We must do away with this justice system that, in contrast to the majority of respectable judges, has others who give more importance to political affiliation than to legal rules, while citizens observe with surprise –and embarrassment in many cases- that all “conservatives” act one way, and all “progressives” the other! We should follow one of the recommendations of the 15-M movement: the procedures for appointing judges should be changed immediately so that, after a hearing and approval from Parliament, ideology is never again placed above the law. An independent judiciary is an essential pillar of genuine democracy. Careful! –because that’s the way it begins- … War with Iran? After “closing the door” on Iraq, another major objective of Israel’s is progressively being revealed: to attack Iran with the excuse that it may possibly produce atomic weapons (and what about Pakistan, China and India… in which it’s not only “possible” but true that they have nuclear bombs?...). For many years now the great producers of weapons and oil (both a part of the world’s “great domain”) have been looking for an excuse for a confrontation with Iran, as was the case a few years ago when they used false accusations against Iraq. The oil reserves in Iran are as large as those in Saudi Arabia, perhaps even more so. Since Israel doesn’t need to talk with the Pentagon to convince them, because Israel is in the Pentagon, there’s concern that something similar to the events of 2003 may occur: more and more news will be reported about the sinister intentions of the governments of these countries until it is finally decided to launch a military invasion, without the authorization of the Security Council. But in 2011 or 2012 things won’t be the same as in 2003 when people were passive, frightened and silent spectators. Now millions of people in cyberspace will show their opposition. A news item published on November 14 read: “The United States says that support is growing for military intervention in Iran”… “Israel has indicated that it may attack Iran on its own accord”… (“El País”, 10 November 2011). “Iran’s nuclear challenge advances and the international community is powerless to respond… The best possible option would be an Arab air attack, led by the Saudis” (“ABC”, 13 November). “London is preparing to assist in an attack on Iran… The United Kingdom would contribute planes and Tomahawk missiles on ships and submarines” (“Público”, 4 November). But this is of no concern to those who permanently support war (“If you want peace, prepare for war”)… For them, these are merely “collateral effects”. No: the people should no longer allow this sinister abuse of power. We can no longer continue as mere spectators. The time to raise our voices has arrived. The G8… G20 (the world’s wealthiest nations) have proved themselves incapable of world governance, including the economy. It is essential and urgent to re-found the United Nations. Only multilateralism can prevent armed conflict through dialogue and mediation, proceeding immediately to regulate and then ban atomic weapons. Mankind should not have to live even one more day under the threat of nuclear war. It is like dying from hunger, a collective shame. These are our real problems and not the speculative stock market fluctuations… these are the problems that affect humanity as a whole. These are our real challenges. Doesn’t Mr. Rajoy know that over 80% of humanity already lives in such austere conditions that if he imposes this first measure, they won’t allow him to impose a second one? For those he represents, austerity measures may be very relevant. But on a worldwide scale –since he is addressing “the world”- it’s unfair and incongruent. If he was referring to the European economy, his measure would still be counterproductive because it is now evident than austerity measures alone will not create jobs, which is what he has announced from the rooftops that he intends to do. Who can create jobs in a western world of budget cuts and austerity? No one. And Spain even less so, due to the heavy burden of the corrupt real estate bubble that, added to the de-localization of production and financial speculation, has left a situation that cannot be mended by merely reducing the deficit and debt, but rather (and above all) requires creativity, re-localization of production and incentives for industry, especially small and mid-size businesses. The solution lies in a democratic Europe capable of sharing, and with solidarity and leadership. Europe requires leadership that will facilitate a fiscal and economic federation, reduce military spending and rapidly create mechanisms for autonomous security to replace NATO and its demands, distancing itself from the “great domain” that is shamelessly harassing its member states. And to the point that the “rescued markets” have replaced democracy and now appoint and dismiss prime ministers. The message that would make an impact, Mr. Rajoy, would be to announce that “Spain will contribute to the transition from an economy of speculation and war (4,000 million dollars invested daily in military spending while 70,000 people die of hunger) to an economy of sustainable global development, guided by democratic principles" (that are so clearly established in the UNESCO Constitution). Moreover, you should convince those who are well-off to share more, applying austerity measures in their own lives, which would undoubtedly make them happier, since it is true that it is more blessed to give than to receive. I love the definition of the “outraged” in the Occupy Wall Street Movement: “We are the 99%!”. There are a few hundred “occupiers”, but a growing number of Americans are showing their overall support for the movement. Protests or proposals? Like the 15-M movement –the global spark for the “dissenters”- these are citizens who are peacefully demanding radical changes, the reinstatement of democratic principles and, above all, equal dignity for all human beings. Everyone has the right to quality of life. These are the “outraged” who participate and are committed. Via cyberspace they will achieve very specific successes by gathering numerous supporters for proposals that, for example, require banking institutions to prove that they do not have funds in tax havens, because otherwise they will withdraw their paychecks and savings from these “shady” institutions… Or by boycotting newspapers that commit serious offenses against the dignity of women, advertising the services of “first class” prostitutes… Or by boycotting products of companies that, for greed and irresponsibility, manufacture the majority of their goods in countries where labor is cheap, ignoring the conditions of their workers and a minimum of respect for human rights. The “outraged” won’t accept leaders who don’t defend citizen participation, transparency, and health and education as public services. In their demonstrations on Saturday the 13th they proclaimed that "our dreams don’t fit on your ballots", rejecting corruption and demanding a new electoral law. It’s clear that with respect to this topic they have already won and it’s unimaginable that new elections can be called under the current law, because hundreds of thousands of citizens will raise their voices in protest, either personally or in cyberspace. Young people, the alienated, those who have remained silent for centuries now demand to be heard. Let’s hear them. Let’s listen. Together we can walk the roads of tomorrow. Despite it all, the only country to-date that has escaped default and not required a rescue is Spain. Portugal, Ireland and Greece, the first objectives of the “great domain” together with Spain –the plural “s” in the term “pigs”- have already fallen into the clutches of the markets and are progressively being caught up in the whirlwind of a “vicious cycle” of budget cuts, deficit reduction, privatization, layoffs and decreases in public spending… without, moreover, being able to print more money (as the United States and United Kingdom are doing, having respectively announced the issue of 300,000 million dollars and 75,000 million pounds sterling). “Bishops urge voters to vote for parties that defend life and marriage”… “The Council of Bishops offers Catholics ideas that aid them in voting responsibly”… (headlines from the press published on October 22). As was the case with education for citizenship (something that we, and they, so desperately need), the Church hierarchy is once again judging matters that are totally beyond their jurisdiction and the scope of religion, such as when they recognize “the moral legitimacy of nationalisms or regionalisms which through peaceful means are seeking a new form of unity within the Spanish State… although it is necessary to protect the common good of the Spanish Nation as a whole, avoiding the risk of manipulation based on any type of separatist or ideological claims”. And there you are: they avoid manipulation by manipulating with affirmations that, in addition to being inappropriate in a democratic country with no official religion, are scientifically unsustainable. The history of the undue interference of religion in science is especially rich in episodes that stain the image of the Church and which would not have occurred if it had kept within its own intellectual framework. I remember that in 1981 I had the honor of attending a session of the Pontifical Academy commemorating Albert Einstein, alongside Pope John Paul II. Many Nobel Prize laureates were present, including Severo Ochoa. Suddenly the Pope apologized for the Church’s unjust treatment of Galileo Galilei. When religion passes from metaphysics to physics, it runs the great risk of committing mistakes, he said. The same occurs –he added, because he measures each word- when science meddles in beliefs… He was probably referring to the book “Chance and Necessity”. “The Church doesn’t care whether the world is flat or round, or whether it rotates on its axis”, he told me… Severo Ochoa and the scientific community represented there were quite satisfied with the unexpected explanations that the Pope offered… which the Vatican has progressively been “putting into their context”. Years later, in 1992, as Director General of UNESCO, I became alarmed at the possibility that genetic engineering could achieve the perverse goals of Hitler and Mengele that they hadn’t achieved with the genetics of Mendel. Thus I commenced a round of consultation with all of the specialists which, with the creation of the World Bioethics Council, culminated 1997 with in the Universal Declaration on the Human Genome, whose Article 11 specifically prohibits cloning human genes for reproductive purposes. In 2003, Carlos Alonso Bedate, S.J. and I coordinated the publication of “Gen-Ética” (Gene-Ethics), a book that provides the data and knowledge required to address with scientific rigor subjects related to the fantastic progress made in genetics and the regulation of epigenetics. For all of the above, as a believer and as a member of the Church “of the Gospel and the sandals”, as Bishop Pere Casaldáliga described it, I wish to express my most energetic protest against this new and intolerable interference of the Church hierarchy in the upcoming elections, addressing aspects in which the Council of Bishops has absolutely no jurisdiction. They also referred to homosexuality (a subject on which they should maintain much discretion) and the Education for Citizenship course as questions to be considered when deciding one’s vote. Education for Citizenship! To be “free and responsible”, in UNESCO’s definition of educated people, set forth in Article 1 of its Constitution. Let’s be free and responsible: after giving it due consideration, let’s vote for those who we believe will better enable all citizens to live according to their own conscience, without obedience or submission to opinions or ideologies that limit the greatness of each human being: his autonomy. In the face of any imposition and obstacle, from any source, let’s endeavor to be free and responsible! Yesterday ETA announced the “definitive end to its armed activities”. I feel very strong emotions, a bittersweet sensation, because the joy of this moment and the perspectives it opens are tempered by the memory of so many years of terror and atrocities. Never again! Will they realize, will we all realize that violence should never be used to defend our points of view? Will we forever retain in our minds and our eyes the images of so many lives destroyed by those who believed that their aspirations could be achieved by killing the innocent? After 43 years of terror and 897 deaths, the terrorist organization is abandoning violence due to duly exercised pressure from State under the rule of law. Unconditionally. Total defeat. Democracy has triumphed. A bittersweet feeling, such as the one I experienced in Chapultepec at the end of the conflicts in El Salvador, or upon initiating peace talks in Guatemala, because the bitterness of so many deaths and bloodshed tempers the joy one feels when the violence and threats cease. And all of the victims prompt a colossal question: after so many centuries, why do we always turn to war and to the imposition of force, always regretting it in the end, but always incapable of preventing them? “Ours will be a democracy without terrorism, but not without memory”, declared President J.L. Rodríguez Zapatero, who has worked so hard to achieve the total demise of ETA. Not without memory: we must all now turn our attention to those who have suffered directly, those who have suffered the most and are still suffering the consequences of terrorist acts. Our steadfast memory so that the secular culture of imposition, dominance, violence and war may give way, now and forever, to a culture of dialogue, alliance and peace. To achieve the transition from force to words would not only constitute the greatest turning point in all human history, but also the commencement of a new era, a “new beginning”. From the raised fist to the outstretched hand. There were not two groups in conflict here: there was a group against the people, against innocent people. Nor was there a “confrontation”, but rather gunshots to the back. Now, the end where before it was touch and go. Not without memory, so that we will never again have to wait, amid unending tension and anxiety, for the terror to end. No more fanaticism, dogmatism, or the obstinacy of those who always believe they are right. No more biased news. We have to endeavor to listen and respect those who maintain positions diametrically opposite to our own. It’s not easy for memory and redress to walk hand in hand. “Building peace in the minds of men” is the great mission entrusted to UNESCO. Instead of “if you want peace, prepare for war”, we must all undertake to build peace in our lives daily. Those of us who, under the skeptical and often hostile gaze of quite a few others, have for years worked to leave the future generations peace for themselves, on earth and with the earth, now express our deepest satisfaction at ETA’s “irreversible” decision. And we seek to strengthen democracy and understanding with the memory of each and every one of the victims. We also express our deepest gratitude to all of those who, often at the risk of their lives, have at last made the end of ETA possible. Who can possibly oppose this conference? Who can provide any reasons for rejecting it? After so many years of horror, isolation, desperation and so many victims, the end of the terrorist group may be near, its members and sympathizers being convinced that they will never achieve their objectives by force. The extremely firm and effective work of the police forces, under the decided leadership of the Government, has progressively debilitated ETA’s sinister operational capacity, together with a change in direction on the part of Basque radical nationalist groups. Everything would appear to indicate that circumstances are now ripe for ETA’s dissolution. The Basque Country, Spain and the whole world would breathe a sigh of satisfaction as another chapter of extreme violence and brutality comes to an end. And everyone could then turn their attention to caring for those who have suffered most directly from the terrorist group’s terrible deeds. The greatest consolation for the inconsolable victims would be knowing that there will be no more victims, no more irreversible suffering. An international group of well-known personalities has decided to support the desires of the immense majority of Spaniards. What ulterior motives lie behind opposition to peace in Euskadi at this time? Electoral fears? The fact that those who consider this event ill-timed are not playing a prominent role? This can’t be. I can’t believe it. I would rather think that it’s unthinkable. I remember that in the 1940s, the end of each chapter of Father Astete’s Catechism on “the what” said: “And now, show me how”. And this is exactly what citizens –some more alert, others more distracted; some more active, others mere spectators…– should now demand of those who are soliciting their votes in the upcoming elections. Because it is extremely risky to continue to trust those who at this late date have not announced their electoral programs (perhaps because they have nothing to announce) and continue to claim that they are going to create jobs, since this is totally impossible in the present circumstances in Europe (and the world over). Because, how are they going to create jobs when the markets’ hounding of the Eurozone, with this colossal speculation fueled by biased rating agencies, forces governments to make all sorts of budget cuts in order to reduce their deficits within an excessively short timeframe? How are they going to create jobs if, contrary to the situation in the United States and the United Kingdom, they can’t print money and “inject” funds to boost domestic production, innovation and corporate participation? How are they going to create jobs if they are forced to cut thousands of them and to halt public construction projects? How are they going to create jobs if the widespread delocalization of production is not reduced? How are they going to create jobs with the tax havens overflowing, and with runaway tax evasion and the underground economy? How are they going to create jobs if they continue to invest hundreds of millions of euros in military spending via NATO? For example, tell me that they are going to resolutely contribute to a European economic and financial federation, and that they are going to issue Eurobonds, basically intended to promote activity and create jobs. That they are going to regulate financial flows and firmly prosecute tax fraud and corruption; that they will not tolerate the immorality and shame of those who collect multi-million dollar fees and severance pay in the midst of so much job insecurity; that they will rapidly create Europe’s own, efficient rating agency…. They intend to overcome the immense incoherence of extreme austerity while increasing the number of workers without adequate incentives. Merely a reduction of debt without growth? Europe, take note: President Obama proposes cutting the deficit by raising the taxes levied on wealthiest individuals and large corporations, and by reducing military spending and adjusting public outlays. He underscored that “This is not class warfare, it’s math”. The Republicans rapidly rejected the plan because it “tears down the social order” that they intend to preserve. And, in addition, there are expressions of good will and purely generic proposals, without indicating how: “The Prince urges efforts to fight the deplorable youth unemployment” (“ABC”, 30 September) and “Rajoy suggests a profound institutional reform as a basis for creating jobs” (“ABC”, 26 September). Moral and political reasons must prevail over economic ones. “Globalization” is coming to an end. Should we delay implementing the required measures until Germany and the emerging countries, including China, begin to realize that demand is decreasing? Because if specific action plans are not proposed soon, there will be many citizens, many more than one may imagine, who will not allow themselves to be deceived, once again, by empty promises. yet dared to do so little "
I remember when I went to Oxford in 1966 to work in the Department of Professor Hans A. Krebs, I was impressed that the seal of the County bears the saying from Horace "Sapere aude". Dare to know! Without knowledge, without a true knowledge of reality, we cannot preserve it, protect it or change it when warranted. Knowledge as an initial requisite... but then it is necessary to use the knowledge acquired appropriately. The essential part of the diagnosis is timely treatment. We have to decide without delay. In our Laboratory for the Detection of Neonatal Neurological Disorders, which cause irreversible brain damage, it was essential to act before the point of no return. In the book "Tomorrow is Always Too Late" I wrote in 1987: "Risk without knowledge is dangerous, but knowledge without risk is useless". -In addition to daring to know, it is essential to know how to dare. In this turbulent and confused era in which we live, which is the consequence of having committed the immense error of replacing democratic principles and ethical values for the laws of the market, it is essential and urgent to change our present course, to cure so many ills, to stop the dramatic worldwide loss of direction and to accelerate the evolution of events in order to prevent the revolution on the horizon. Dare to do it. Reject the hounding from the great (economic, military, energy, media) powers and make things crystal clear. - Immediately restructure NATO, endowing the EU autonomy in security matters, and ceasing to acquire unnecessary and outdated military equipment. - Fiscal and economic federation, and the emission of Euro Bonds, being careful not to exaggerate attention toward certain “locomotives” that run the risk of losing freight cars and passengers. - Reasonable postponement of deficit deadlines, regulation of financial flows and the definitive elimination of tax havens. -Incentives for R&D and innovation. -Immediate return to multilateralism, endowing the United Nations system with the required human, technical and financial resources. Dare to do it. It can be done. Rise up. Let’s not warrant the disdain of the coming generations to whom we owe a less somber future.